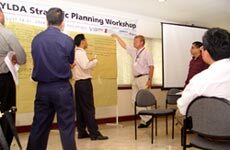 A strategic plan and a program of activities for the next two years are the tangible results of the first Strategic Planning Workshop of the Young Liberal and Democrats of Asia (YLDA) held in Manila from August 18-21, 2004. During the three-day-planning session at the premises of the liberal Foundation, the young liberal leaders from seven Asian countries reviewed the organization’s mission and vision statements, assessed the group’s strengths and weaknesses and finally defined a list of strategic goals that will guide YLDA’s activities in the coming years. “I feel a sense of accomplishment, now that we have a strategy”, said YLDA-Secretary General Rajendra Mulmi, who represents the Youth Initiative of Nepal, at the end of the workshop. The strategic workshop was followed by a special General Meeting, where YLDA formally resolved to establish the organization’s permanent secretariat in Manila. The workshop also decided on the date and venue of the second General Meeting. This will be held in Kathmandu, Nepal in the second week of October 2004. Among the political highlights of the Manila-event was a visit to the Philippine Senate, where the young Liberals were welcomed by Senate President and Liberal Party of the Philippines Chairman Frank Drilon. The workshop was hosted by the Kabataang Liberal ng Pilipinas (Kalipi), the Young Liberals of the Philippines, and sponsored by the Friedrich-Naumann-Foundation. “Asia’s young Liberals have always been an important target group for the liberal Foundation”, said Dr. Ronald Meinardus, who facilitated the event together with CALD Executive Director John Coronel and has been involved in training programs for the youth for many years. Dr. Meinardus lauded the workshop participants for their creativity and discipline in formulating the strategic plan. “Now that the group has a strategy, the challenge is to implement it,” said the Foundation’s representative, and added that his organization would continue to assist YLDA in promoting its objectives.